Jess + Matt’s stunning new album ‘Songs From The Village’ is Out Now! Sydney’s mesmerising duo, Jess + Matt, (Jess Dunbar and Matt Price) have today released their stunning new album SONGS FROM THE VILLAGE via Sony Music Entertainment Australia. The record is an earnest collection of iconic songs that heralded the folk revolution, honouring celebrated artists such as Simon and Garfunkel, Bob Dylan, Joni Mitchell and more, through captivating and delightful renditions. So much respect, in fact, the couple – who got engaged in early 2017 – retraced the steps of those folk revolutionaries across many of their stomping grounds in New York City. It was a pilgrimage that would not only be inspiring but shape SONGS FROM THE VILLAGE immeasurably. 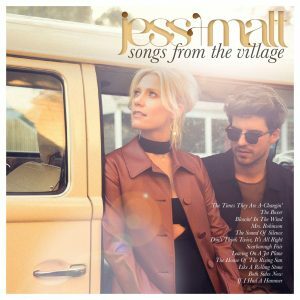 SONGS FROM THE VILLAGE also includes the stunning track ‘The Sound of Silence’ which Jess + Matt recorded with Chris Isaak. SONGS FROM THE VILLAGE treasures simplistic melodies and expressive storytelling, gorgeously propelled and angelically lifted by Jess + Matt’s warm tones and rich harmonies. The pair harness a rare musical ability to transcend time, resonating a nostalgic presence through song. To celebrate the upcoming release of SONGS FROM THE VILLAGE Jess + Matt have announced some special pop-up gigs and in-stores, with more to be announced, see details below.